Hamar Laser’s new Lathe9 software supports our L-700 Spindle Alignment system equipment to create a powerful tool for aligning lathes or other turning-type machines. 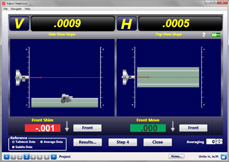 This comprehensive and easy-to-use program displays live readings of the horizontal and vertical center (offset) and the horizontal and vertical angular (slope) readings of the tailstock to the headstock and also checks the straightness of the bed ways and parallelism to the main spindle axis. Headstock spindle-axis parallelism to tailstock or turret bed ways. Headstock spindle-axis alignment to: subspindle, tailstock spindle or turret spindle rotation axes. Lathe9 guides the user through the alignment with a 6-step process, designed to align a lathe the best, most efficient way. First the setup data is entered. Then the bed ways are checked for straightness and it is determined if the headstock spindle axis is parallel to the bed. If these geometries are out of spec, they need to be fixed first. 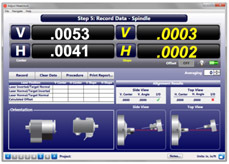 Lathe9 then takes data for the headstock spindle alignment to the tailstock or turret and provides a live, 4-axis display of the alignment, along with shim value calculations to align them. Finally, a printed report details the alignment of all the lathe geometries. Results can be plotted, saved, and exported to an Excel spreadsheet for further analysis. After following the simple Lathe9 procedure to align the laser to the headstock spindle axis, the T-261 Target is inserted into the tailstock or turret (saddle) and it is moved down the bed to take straightness data. At the end of the run, Lathe9 automatically calculates the bed-way straightness and parallelism of the spindle axis to the bed. It can even check parallelism of the turret bed ways if they are separated from the tailstock bed ways. By following our simple Step 2 procedure, the laser can be aligned exactly to the spindle’s axis of rotation, which can then be projected out to 100 feet (30 M) to measure bed-way parallelism of even the largest lathe. The alignment displays the update with each adjustment in four axes: V-center, H-center, V-angle and H-angle. This allows the user to quickly correct misalignment errors. Additional features include the ability to zoom in and out of the graph area, to change direction when recording data, to select the target orientation when performing the NORMIN procedure and to automatically move from one point to be measured to the next. 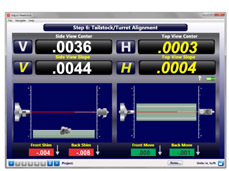 The Data Source view may be changed from tailstock, saddle, or from both tailstock and saddle, and results can be displayed with the best-fit line, tolerance bands and pitch and yaw data. 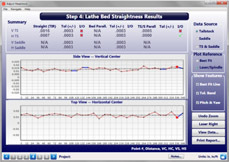 Reports can be customized to show the results relative to the laser or the bed-way best-fit line, comments may be added, and the report can be printed with a summary, a graph of the vertical and horizontal straightness, comments and a table showing the recorded data. 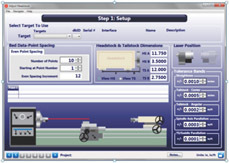 Select the target and computer interface to be used in the alignment and the side of the lathe on which the user is standing. Enter the headstock and tailstock dimensions, choose the number of points to be recorded and enter the alignment tolerances. The dimensions are used to calculate shims when aligning the headstock, tailstock and/or turrets. 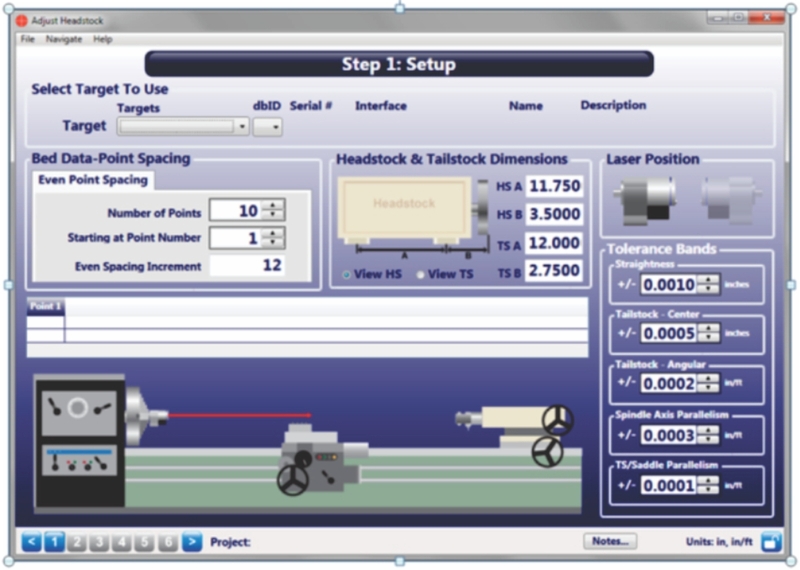 The alignment tolerances are automatically applied to the displays, results screen and graphs. 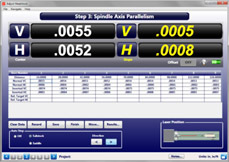 Align the laser to the headstock spindle axis by following the NORMIN procedure, where one set of data is recorded with the spindle/laser in the NORMal position and a second set is recorded with the spindle/laser in INverted position. Display offsets are automatically applied so the user zeros out the laser's four axes of adjustment to make it parallel and coincident the spindle axis of rotation. 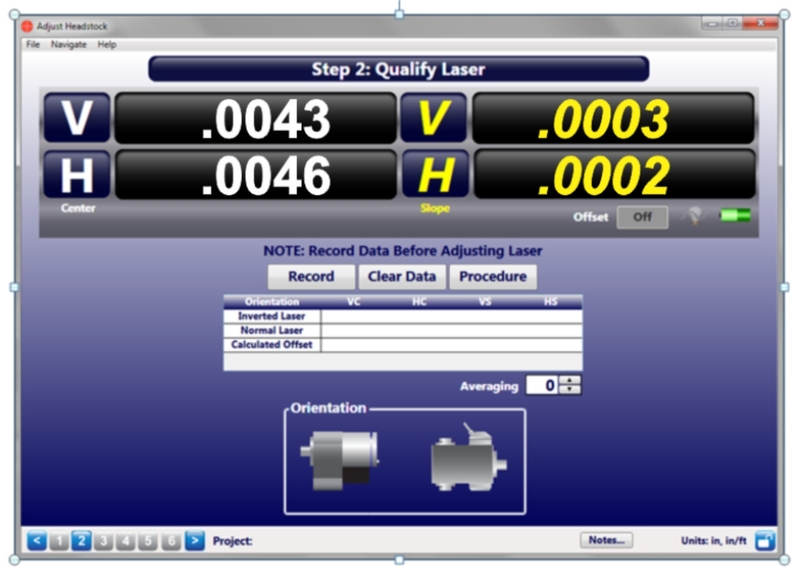 After qualifying the laser, straightness data is recorded for tailstock bed ways, the turret (saddle) bed ways or both, using the number of points selected in Step 1. Lathe9 records four axes of data (V-center, H-center, V-pitch, H-yaw) at each location along both sets of bed ways. This is especially helpful where the tailstock and turret (saddle) ride on separate machine ways. To take the data, the target is mounted in the tailstock or turret (saddle) and moved along the bed to each point. Press the spacebar to record the values. 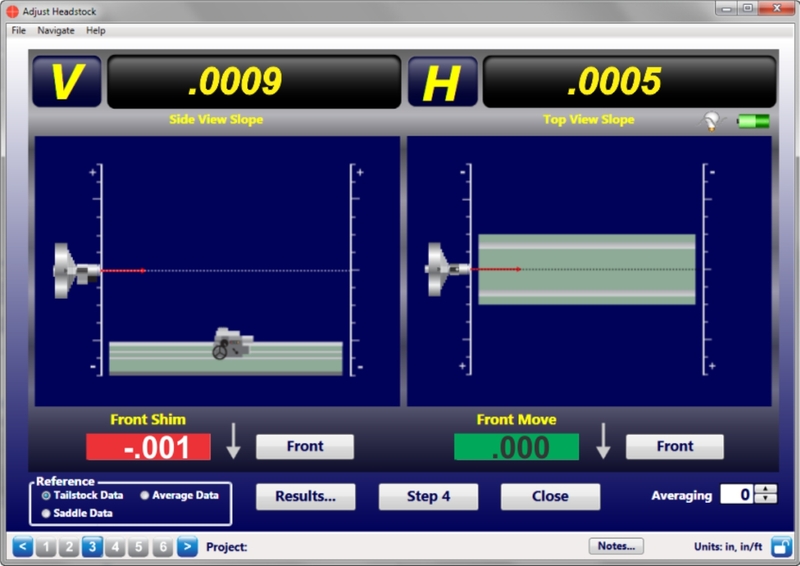 When finished, click the Results button to view the alignment data. ways and the parallelism between the two sets of bed ways. A check mark or X displays if the data is in or out of tolerance, based on the tolerances entered in Step 1. 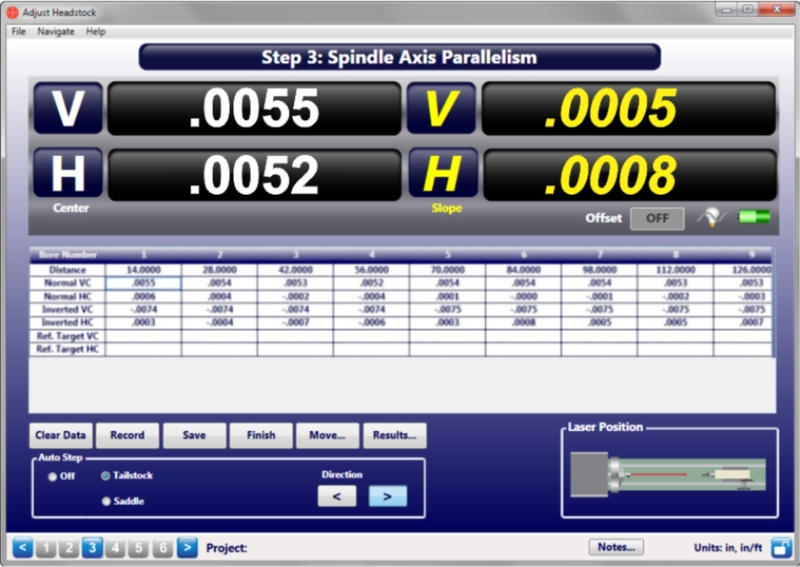 Click the Move button in Step 3 to open the Headstock Spindle-Axis Live Move Screen. In this screen, the headstock may be aligned to either the tailstock bed ways or turret (saddle) bed ways or an average of both. Shim values are calculated to align the headstock and a live angular display shows whether the alignment is in or out of tolerance. 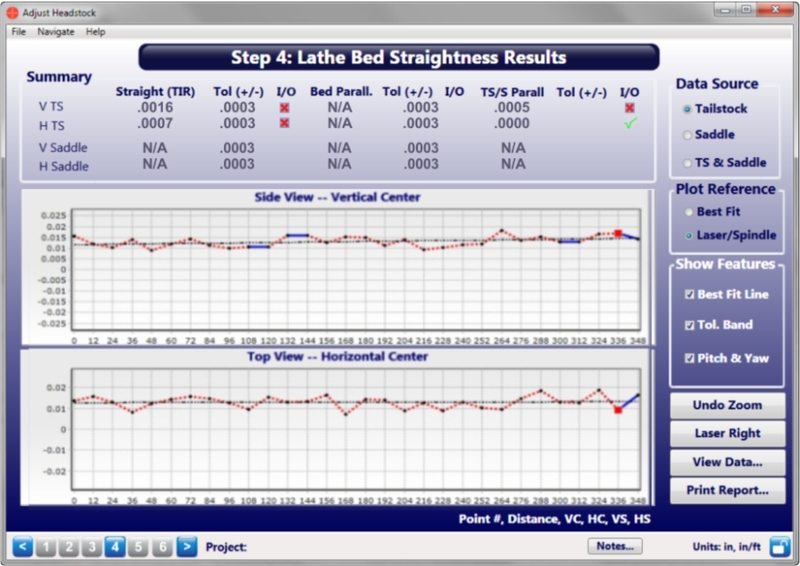 After the alignment is completed, the lathe-bed data needs to be re-recorded to verify the alignment. The parallelism between both sets of bed ways. Results are displayed in the table and are compared against the tolerances defined in Step 1. Straightness is then plotted on a graph, showing whether the data is in or out of tolerance. The pitch and yaw values at each location are also plotted. 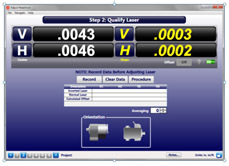 The user may choose which set of data to plot and what reference to use: the laser or the least-squareness, best-fit line. Clicking a point on the graph displays the data for that point. A report may now be printed or the user may proceed to the Tailstock Axis Live Move Screen to align the tailstock or subspindle to the headstock spindle. After the headstock spindle axis has been aligned to the lathe’s bed ways, Step 5 is used to take data for the alignment of either the tailstock or a subspindle to the headstock spindle axis of rotation. It takes about three minutes to record the data and on-screen instructions guide you through the procedure. Once the data is recorded, alignment results are calculated and compared against the tolerance and a graphical display illustrates the alignment. Display offsets are also automatically applied to the live, 4-axis display to show the alignment of the tailstock or subspindle to the main spindle. 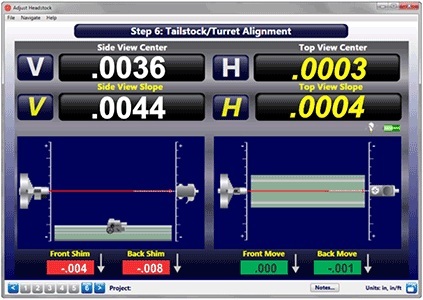 If the data recorded in Step 5 is out of tolerance, the misalignment can be fixed in the Step 6: Tailstock/Turret Alignment screen. 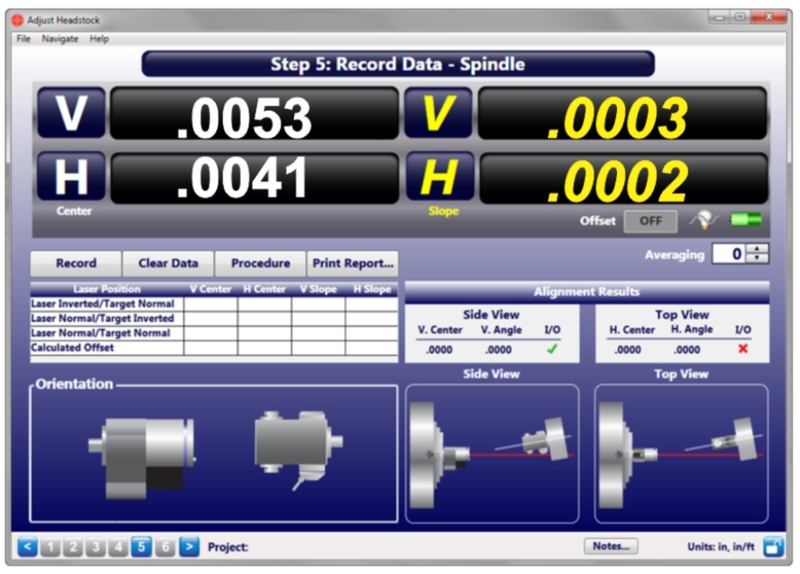 Lathe9 automatically applies display offsets so the live, 4-axis display shows the actual alignment results. It also calculates the shims necessary to align the tailstock or turret. Live spindle graphics (vertical/side view and horizontal/top view) automatically update with each move, showing how the alignment is progressing. When the shim displays turn green, the alignment is complete.